Years adding up to the #8 are represented by Justice. During the Justice year, emotional, spiritual, physical and mental balance are vital. Striving to maintain it is a primary focus. Questions surrounding authority are highlighted as are issues around fairness and honesty. You’ll likely have no time for liars and despise injustice everywhere. This is a year where the lessons of karma are emphasized. You’ll clearly recognize how the smallest action or thought can cause the grandest of changes. During this year, it is especially important that you take time to regularly realign yourself, rejuvenate and rejoice. The shadow symbol for Justice is the Star. 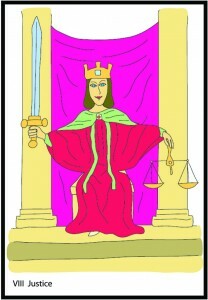 § 2 Responses to Growth Year #8 – Justice"
#8 in the major arcana is strength. strength is #11! how is this correcT?!! Thanks so much for visiting The Tarot Room, and for writing! Have a great weekend!